First ever photos of snow leopards in Tuva, Russia. A mother and two cubs. Photo taken by Alexander Kuksin. The first Russian-Mongolian research expedition to study snow leopard numbers in the Republic of Tuva ( tiny republic in the south of Russia) took the first ever photographs of snow leopards in that region. The team found 14 tracks of the cats on the Tsagan-Shibetu ridge in the western part of the country just in the last few weeks. The photos include an adult female with her two grown cubs. 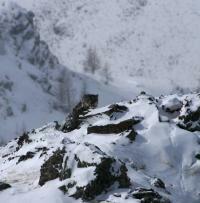 A close up of snow leopard in the tiny Republic of Tuva, southern part of Russia. First ever photos of snow leopards taken there last week. Photo by Alexander Kuksin. Next month the research will continue across the border in Mongolia. Meanwhile the Russian team, along with WWF is also working on the possibility of eco-tourism in the region to support the local people in this remote part of the world where there is little in the way of employment. This is truly good news about snow leopard numbers in this region, a hope that although numbers are small, they may be increasing. Read more about Tuva and see a map at Wikipedia.